This post shows a way to add some variety to practicing closeouts. I received it as a part of the most recent University of Washington Women’s Basketball Coaching Newsletter written by Coach Mike Neighbors. If you would like to receive Coach Neighbors’ newsletter, let me know and I will pass on your email address to him. On the skip pass, the first defender in line will close out. On the skip pass back to the original side, the next defender in line, X2, will close out. On the skip, X1 will jump to help. On the skip, the next defender in line, X3, will close out. X1 steps off and to the end of the line. The rotation continues from there. Coach drives the basketball with a defensive “dead” Call. Drive to the lane, helpside defender takes the charge. Coach skips the ball after the charge, next defender closes out. 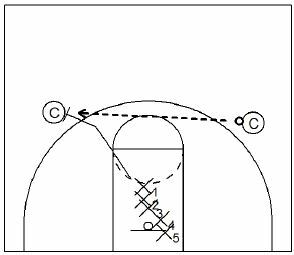 some time ago you posted a zone offense quick hitter from Lithuanian team. guards cutting thru to corners…? i cannot seem to locate it and it is a good match for this years personnel. any help would be greatly appreciated. I really enjoy the info shared, it has been a great help to our program! Thanks for sharing! Thanks for the kind words. Is this the set that you were looking for?